Our blog is just one more way we encourage communication between our staff and clients, allowing them to post important messages, contribute stories, and share their successes. Staff and clients are welcome to submit entries and join in current threads. If you have been set up with an account, please log in to begin blogging. With a full barn and lots of lessons it's been a busy time here in central Virginia. The two ponies, Bee and Rose, are being kept particularly busy by a number of little girls between the ages of 8 and 12. Rose seems to have found a new lease of life despite her 30 years of age and recently joined Bee on a 2-hour trail ride through the woods, the highlight of which, for the human participants at least, was the sighting of a bald eagle. Another highlight for all, however, was the picnic break by the lake! On the competition front, Gerry and her 9-year-old ISH mare Diamond Jubilee made a successful step up to Training Level at the Kelly's Ford horse trials, taking 7th place. The pair also placed 4th in the modified jumper class at the Farmington Hunt Show indoors at The Barracks Equestrian Center just outside Charlottesville. Two weeks later, boarder Carly Eddhari and her magnificent Freedom Z 5-year-old, Formidable Z, took 1st place in their novice division at the Virginia Horse Trials in Lexington. This was a big challenge for a young horse, given the busy atmosphere at the Virginia Horse Center complex, with the show-jumping taking place in the imposing Colosseum. There is just one horse trial left to contest, CDCTA, on November 10th, and the Cedar Crest representative there will be Ali Lindsay riding Christine Kennedy's Friesian cross gelding, Midnight Sky Noel. Penny Sparkle continues to romp around the trails but Ruby has just about got too big for her girth and will have to take time off until her Balou de Rouet foal is born next May. Although the days are getting colder and the darkness falls sooner, there is still plenty of outdoor riding to be done down here and Gerry would welcome visitors at any time. So far Ted Ambrosini, Tim Helwick (twice! ), Kim Tripp, Rosina Williams and Julia Rubinic have made the trip and all have survived the experience! New service offered for our boarders in Virginia! It transpires that some horses enjoy being dusted! Certainly that is the case with Carly Eddahri's 5-year-old Freedom Z gelding, Noah, who enjoys every moment of his life at Cedar Crest Farm in Virginia. He doesn't think the barn help should waste their time de-cobwebbing the bars when they can be dusting his face instead. Noah plans to be an international star when he grows up but presently, when he is not training to be a famous eventer, he divides his time between playing in the paddocks with his mates Nolly and Concerto and sleeping in his enormous stall. And getting dusted of course! He is a lucky horse in other ways too. Carly's husband, Vincent, is Devoucoux's mid-Atlantic representative so Noah sports all the finest tack and equipment as befits of a horse of his caliber. Long time rider at Cedar Crest Farm, Tim Helwick, who together with his wife Elaine Buckberg now resides in Washington DC, found his way south on the weekend of September 7th and 8th to experience some trail riding in the Blue Ridge Mountains. Tim was reunited with his old friend (or perhaps adversary!) the lovely but temperamental Ruby Sparkle who is now three months in foal to Oldenburg show-jumping sire, Balou de Rouet, for some long rides in the woods. Apart from an unsettling incident with a swarm of bees a good time was had by all and Tim has vowed to return again. Gerry and Ali, who now divides her time between her senior year at school and working part-time in Dover Saddlery, would welcome more guests from north of the Mason-Dixon line! Team Cedar Crest had a successful outing to the Riga Meadows Horse Trials in Salisbury, CT on Sunday, July 14th. Ali Lindsay and Darragh Promise scored their third Training level win in a row, finishing on their dressage score of 30.9. The pair now head for Fitch's Corners next weekend when they will tackle their first Preliminary division. Cedar Crest coach, Pam Lyon, had a busy day as she rode David Older's gelding, Pint O' Guinness (aka Finn), into 8th place in a Novice division in the morning. After a creditable dressage score and a clean show-jumping round Finn also jumped clear on cross-country although he accrued a few time faults along the way. Pam then rode Mia Coleman's cracking pony, JoJo, into third place in their Beginner Novice division in the afternoon, with JoJo putting in some impressive jumps over both the show-jumps and the cross-country obstacles. Gerry Lindsay's Virginia bred Irish Sport Horse mare, Diamond Jubilee, was competing in only her second horse trial and put up a creditable performance with a good dressage score and a clean show-jumping round. One refusal on cross-country put them down the placings but the mare enjoyed her outing and will doubtless have gained from the experience. Roll on Fitch's and Millbrook! Despite miserable, damp weather we came home with high spirits after a great day out at the Kelly's Ford Horse Trials just to the north of Culpeper. Ali rode her new Irish import, Darragh Promise, into 3rd place in the Training Rider Division and Gerry and her Virginia-bred Irish Sport Horse mare, Diamond Jubilee, placed 8th in the mare's first event after a dither at the water jump cost her 20 penalties. Ali's next outing will be to the Virginia Horse Trials in Lexington over the Memorial Weekend. Our day out was made even more fun by an unexpected encounter with Susan Aiken, the breeder of our miniature schnauzer, Sparky! A dear friend and former Cedar Crest boarder, Mary Warlick, sent her two chestnut thoroughbreds down from snowy New York to over-winter in Free Union while she completes her book on the history of advertising. Old stager, Cato, and the young pretender, Dasher, enjoyed the open spaces at Chapel Springs but Cato was particularly overjoyed when Mary came down to visit for a week at the end of February. I don't think I have ever seen a horse show so much pleasure at the sight of a human being! Mary was able to ride both her boys as well as accompany me on hacks through the woods and trails on some of the horses we have stabled in Virginia. She stayed in a comfortable hotel in Charlottesville but spent all day, every day, at Chapel Springs and declared it to be a great riding vacation! I hope many more of our friends will make the trip south to have some fun on horseback and to experience the many pleasures of Charlottesville, not least the excellent "locavore" cuisine. Clear round will run from 8.30 until 10 am. Please indicate on arrival the height you wish to jump as they will increase throughout the morning. A ribbon will be awarded to each clear round. A class of 7 fences including oxer’s with no combinations. Clear rounds qualify for a jump off/ speed round of 5 fences which is timed. Fastest time wins. Penalty’s for each pole down refusal, or run out. Includes 8 fences with a combination. Clear rounds qualify for a timed jump off round. Includes 8 fences with a six fence Jump off course for those who get a clear round. Includes 8 Fences with a 6 fence jump off course for those who get a clear round. Jumps set at various levels of difficulty and heights. Each have an assigned point value depending on the difficulty. Each rider has 60 seconds to get as many points as they can and each fence can only be jumped twice in either direction. A tie will result in a jump off. NO DOGS PLEASE, ALL VISITING HORSE’S MUST HAVE A CURRENT COGGINS, REFRESHMENTS WILL BE AVAILABLE, RIBBONS WILL BE AWARDED TO 8TH PLACE, PARKING AND WARM UP SPACE IS LIMITED DUE TO THE WINTER WEATHER, THEREFORE WE WILL BE REGULATING THE NUMBER OF ENTRIES PER CLASS SO PLEASE SEND YOUR ENTRIES IN AS EARLY AS POSSIBLE. PLEASE SEND, CALL OR EMAIL ENTRIES BY FEBRUARY 12TH 2013. Paul and I were fortunate recently to purchase two beautiful mares from legendary event rider, Phyllis Dawson, in northern Virginia. They both have Flagmount Diamond breeding on their sire's side so are related to Flagmount Cliff (aka Kazu Makino's "Harry") as well as the wonderful Flagmount Ivy who I bought and then sold on to Cathy Ziobro of Washington DC in 2012. Noble Maiden (stable name Betty) has joined the team at Cedar Crest in New York whilst I have custody of the lovely Diamond Jubilee. I think they will both garner a crowd of fans with their good looks and that wonderful Irish temperament! Jubilee is known by her friends as Bella and not only does she have great bloodlines on her sire's side, but she is also a grand-daughter of the TB stallion Babamist through her dam, an intermediate event mare named Rejoice. Babamist was mentioned in the latest US Eventing magazine by Bruce Davidson as being one of the most influential TB sires of all times. As can be seen from her photo, Bella is rather plump and out of condition at present but we'll soon work that off! 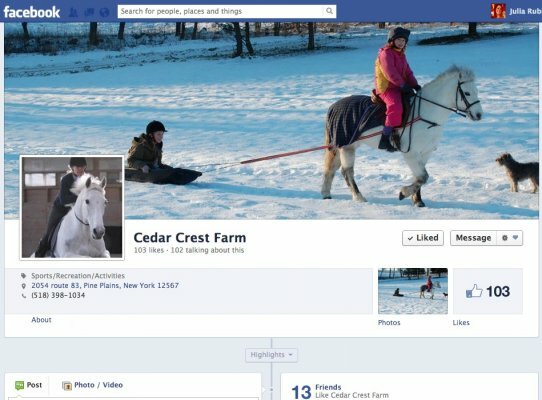 Everyone, come check out Cedar Crest's new Facebook page, and if you like it, you should "Like" it!